The Waterloo Warriors fought hard till the end, but were not able to collect full points due to a harmless shot on goal midway through second overtime, in a matchup with the Windsor Lancers. The Friday night game at the Columbia Icefield Arena saw the two teams trade goals till the very end, as the Warriors tried to hold on to leads of 1-0 and 2-1. The Lancers —fifth place in the OUA West division ­­— got the winning goal from Konnor Haas, and the win gave the Lancers a two-point cushion over the Warriors, who are eighth place in the OUA West. Mike Morrison (Hamilton) had a great night between the pipes for the Warriors with 26 saves; however, one harmless deflected shot squeaked by halfway through second overtime. The Warrior goals were scored by Riley Sonnenburg (Cambridge) and Stephen Silas (Georgetown), while the Lancers saw goals from Tyson Ness, Dylan Denomme, and the OT winner by Konnor Haas. The first period saw the Warriors outshoot the Lancers 8-3, but they were unable to put a goal on the board. The second period saw the Warriors fend off a five-on-three power play by the Lancers, and shortly after, Sonnenburg scored to give the Warriors their first goal and lead on the night. By the end of the second period the Lancers were able to tie up the game at 1-1, as a Morrison save saw the puck land on Ness’ stick — who pounced on the juicy rebound. The Warriors started the third period on a five-on-three man advantage, and were able to make good when Silas’ rocket one-timer found the net. The Lancers, however were not to go home quietly. 52 Seconds later, although shorthanded, Denomme scored on a breakaway to tie the game up at 2-2 heading into overtime. 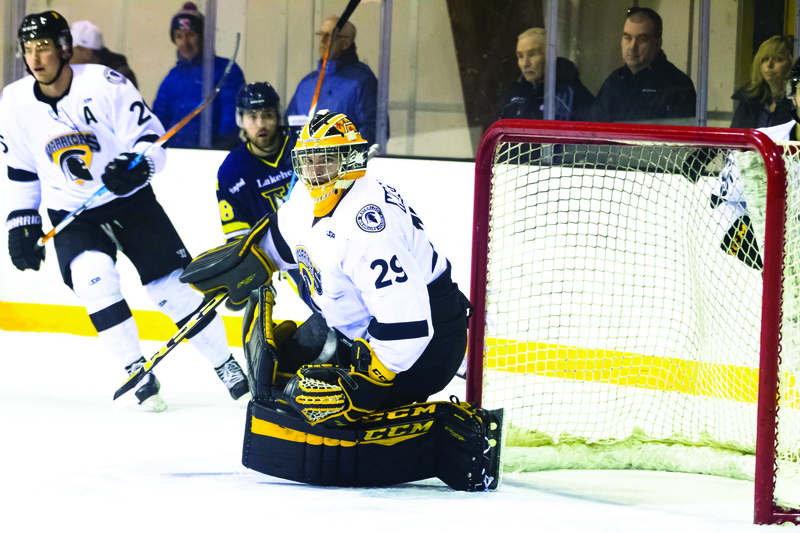 The first overtime saw the Warriors dominate in shots on goal; however they were unable to find the winner. As a result, the Lancers, scoring on a harmless deflected shot, took the full points in second overtime. Next up for the Warriors is their final game of the 2016-17 regular season, as they host the Toronto Varsity Blues in an attempt to solidify their playoff seeding, on Saturday, Feb. 11. Puck drop is scheduled for 4 p.m. at the Columbia Icefield Arena, and live on oua.tv.